Mario Tennis Open's global release dates are in, and it's a tight grouping. North America gets the game first on 20th May, before Japan on 24th May and Europe on 25th May. Camelot's first online game in the series includes head-to-head multiplayer with skill-based matchmaking. Nintendo has also revealed you'll also be able to pick up medals from defeated players, check out your standings in monthly leaderboards and more. 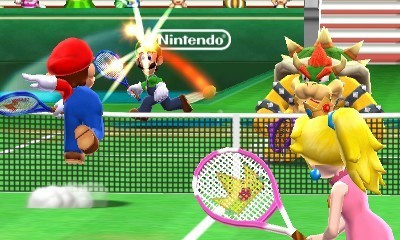 Will you be taking a shot on Mario Tennis Open for 3DS? Cannot wait to get this! I didn't expect this to come out this year! And with multiplayer? Oh yes. So I'm assuming that there's (sadly) no RPG single-player mode? ill get this depending on the price. my guess is it will be 40 dollars like most mario and 3ds games. if so im not getting it new. ill probaly get a used one later. but you never know. my birthday is may 22. only two days ahead of the realease date so somone may get this game for me since i love tennis. Sweet! I'm definitely grabbing this one! Maybe, I've never played a Mario Tennis title. @SkywardLink98 Mario Tennis is pretty fun. you should give it a chance sometime. Multiplayer online count me in. next up is mario GOLF or hoops 3 on 3 with wifi.yep cant wait. I need to pre-order this and Kid Icarus ASAP. Medals from beaten opponents?! Is this a foreshadowing of things to come? Medals for 3DS and Wii U, like achievements? I hope so. Just maybe! The only sport game I've tried (besides Mario Kart, but I think racing is a way of life, not a sport lol) was Mario Golf, and loved it. Since this is a Camelot game, if I have the money I may even reserve it.